At Kingsdale Animal Hospital we have over 10 full and part-time employees who are here to help care for your pet. Dr Ashley Boultbee graduated from the Ontario Veterinary College in 1997. She worked at various practices in Toronto and Woodbridge before becoming the owner of Kingsdale Animal Hospital in 2010. Dr. Boultbee has lived in King Township her entire life. She grew up in Kettleby and currently lives in Schomberg. Dr. Boultbee feels privileged to have the opportunity to practice in this wonderful community. Dr. Boultbee lives in Schomberg with her husband Peter and their three children Jacob, Kate and Charlotte. Their family has two cats, Ziggy and George and recently adopted a rescue puppy named Pippa. George is the official Kingsdale Animal Hospital mascot. Dr. Boultbee enjoys hiking, biking, canoeing, and camping and has recently started horseback riding again after a ten year hiatus. She also enjoys travelling, especially to remote or developing countries. In 2008, Dr Boultbee was the veterinarian as part of a team that travelled to Pond Inlet, Nunavut to provide volunteer veterinary services to this remote community. Dr. Boultbee has also participated in two medical mission trips to Nicaragua to provide human medical care to remote communities in that country. In 2012 Dr. Boultbee joined a six-member team in Mulege, Mexico operating a sterilization and vaccination clinic under the auspices of the Canadian Animal Assistance Team (CAAT). Read the full story here. She is currently looking for another opportunity to volunteer her veterinary services to a community in need. 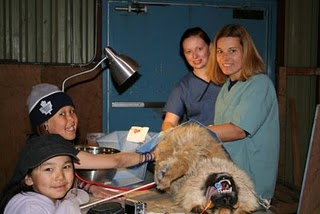 The Canadian Animal Assistance Team is made up of veterinary professionals dedicated to the care of animals worldwide. Their mandate is to have an impact on the safety, health and population control of domestic animals worldwide by providing education, ensuring domestic animals are included in disaster response plans, providing spay and neuter clinics for domestic animals in rural / underserved areas, and assisting in relief efforts after natural disasters. Dr. Sarah Kramer grew up in Thornhill and her strong interest in animal health lead her to become a veterinarian. She studied at the University of Guelph, where she completed her Bachelor of Science with Honours in Zoology and then her Doctor of Veterinary Medicine. Upon graduation she was awarded the Charles Duncan McGilvray Prize for making significant contributions to the Ontario Veterinary College through scholarship and leadership. Sarah enjoys all aspects of veterinary medicine, but her special interests include surgery, internal medicine, and ophthalmology. In her spare time she enjoys travelling, training for triathlons, cooking and spending time with her husband, their dog, Cutie, and their rabbit, Nibbles. Stephanie started out as a client at Kingsdale Animal Hospital and then ended up working here! She has been with Kingsdale Animal Hospital for over 20 years. Stephanie has a B.Sc from the University of Guelph. She received her ACT (Animal Care Technologist) and RVT (Registered Veterinary Technician) qualifications from her training at St. Lawrence College in Kingston. She is a member of the Toronto Academy of Veterinary Medicine and regularly attends their continuing education lectures. Stephanie has had a number of pets over the years. Right now, she is the proud owner of Hildebrandt (aka Hildee), a blue tick Coonhound, Gwynevere a rambunctious lab, and a cat named Mayhem. Stephanie enjoys walking and often participates in fundraising walks and she also enjoys relaxing at the cottage. Pictured with Hildee and Gwynevere. Lisa started working at Kingsdale Animal Hospital in 2012 with an Ontario College Certificate in Animal Care. Under the guidance of Dr. Boultbee, Dr. Sowerby, and Stephanie, Lisa was able to grow as a veterinary assistant and loves being a part of the Kingsdale team. She loves the one-on-one interaction with each and every pet, and really enjoys chatting with the clients. After 3 years, Lisa decided to further her education so that she could help out more at Kingsdale. Lisa graduated from the Veterinary Technician program at Seneca College in the spring of 2017. We are so happy to have a second RVT on staff now! When she’s not studying, or working at Kingsdale, Lisa enjoys going for hikes, watching horror movies, or reading a good book with her bearded dragon, Amadeus. Here she is pictured with the happy-go-lucky, Lola. Katrina started with Kingsdale Animal Hospital as a high school co-op student. She recently graduated Seneca College as a certified Veterinary Assistant and joined Kingsdale Animal Hospital in August 2017. Katrina spends most of her day assisting Dr.Boultbee and Dr.Kramer with their patients in the exam rooms, and assists with surgeries as well. She also works for Vaughan Animal Services where she provides loving care for the animals in the shelter. In her spare time she enjoys horseback riding and spending time with family and friends. She is a proud owner of Benjamin, a Himalayan cat. Nicole has been with Kingsdale Animal Hospital for the past year. She is the mother of 4 children (including a set of twins!) and 4 fur babies. She owns two Shih Poo's named Milo and Gunner, a Shih Tzu named Blue and recently acquired a beautiful German Shepherd puppy named Gia-Grace. Animals have always been a passion of Nicole's and she says she feels very blessed to be able to work at Kingsdale Animal Hospital. She feels fortunate to work with like-minded individuals who share her passion and dedication. Nicole and Dr. Boultbee worked together at another clinic several years ago, so they are excited to be working together again. Nicole is very grateful to all the pet owners who have made her feel so welcome. Elise recently joined the Kingsdale Team in as a Receptionist/Veterinary Assistant. She has a Certificate in Animal Assistant from Northern College. She enjoys the hands on learning with the veterinary assistant work but has also loved being at the front desk so she can make new connections with people as well. She’s always loved animals, since age 6 when she started horse back riding lessons and her family got their first dog. The love Elise has for animals has pushed her to work in the field she is in. She wants to stay at Kingsdale and learn from Dr. Boultbee and Dr. Kramer before heading back to university to get her undergraduate degree in Zoology. Once she has that degree under her belt, she hopes to get into veterinary school. Growing up Elise always wanted to be a veterinarian. She would love to open an animal sanctuary in Thailand or Africa where she can do her part to conserve more endangered species. Until then she will be goofing around with her own wacky animals. She has 4 dogs and 1 cat; Diesel, Zeus, Kalea, Kai and Simon. Melanie has been a part of the Kingsdale Animal Hospital team since 1992. She works as an animal assistant primarily on the weekends, as she has a full time job elsewhere. Her full time job involves number crunching, so she really enjoys her weekends at Kingsdale where she can enjoy the company of our four legged friends. In her spare time Melanie enjoys being involved in Vintage Racing with her dad. She is the owner of her lovely Norwegian Forest Cat, Indy. She is also part time owner to clinic cat George and is always threatening to take him home with her. Lisa graduated from the B-Pro Grooming Academy and has been grooming for six years. Lisa shares her home with her husband, Chris, their three teenage sons, and two dogs, Roxie and Lylah. In her spare time she enjoys camping, hiking, and gardening. Call or email us today to book your dog in with her. Pictured with Lylah and Roxie.